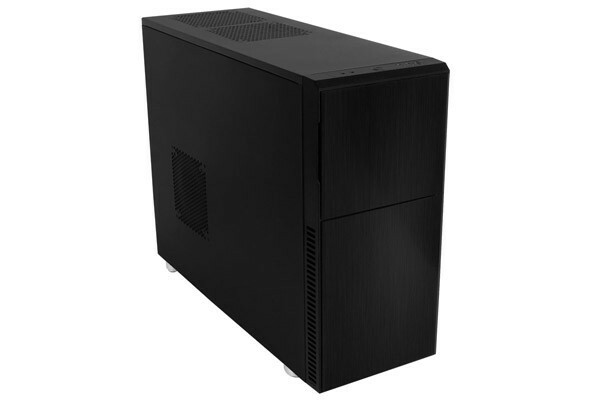 With the Deep Silence 2 we present the next model of the next generation of silent PC cases. The upper part of the front offers a foam-isolated door, equipped with a magnet to ensure a fast closing and easy opening. Three 5.25 inch bays can be found behind the door, as well as the 2-channel fan control for up to six fans and the reset button. On the front of the top cover you can find the I/O-panel. It offers 2 x USB 3.0, 1 x USB 2.0, as well as Mic and Audio connectors. This ensures that appropriate devices can be connected quickly and easily. The front USB 3.0 ports can be connected internally. If your motherboard should lack such an internal port, please purchase an appropriate adaptor cable. Graphics cards with a length of up to 345 mm can be mounted in the Deep Silence 2 with no additional effort. If that is not enough, you can remove the special designed Mounting Frame for another 25 mm space – a total of 370 mm. And we thought about the fans of air-cooling as well – up to 165 mm installation height allow a broad variety of CPU-coolers to be fitted in the case. And if you like to install water cooling systems in your cases, use the mounting frame to install a 120 or 240 mm radiator with as many as four additional fans behind the HDD cage– without colliding with the motherboard or the power supply. On the back side are as many as seven PCI expansion slots - the installation of a multi-GPU system is thus possible without difficulty. The Nanoxia Deep Silence 2 offers a lavish cable management system. A total of nine rubberized openings are available in the motherboard tray. In the course of the many years of development work which culminated in the Deep Silence case series, the focus was always on two requirements: minimize noise and minimize system temperatures. Substantial effort was thus invested to minimize the noise levels. The hard disk drives of the Deep Silence 2 are mounted using rubber suspension, in order to absorb vibrations that might arise during startup and to minimize annoying background noises. The power supply rests on rubber mounts, with a suspension frame available on the back. Rubber suspended case feet, crafted in the classy "hi-fi" look, combine with other features to safely contain all vibrations to assure ultra-silent operation of the PC system . Also responsible for the quietness of the case are the three pre-installed Nanoxia fans of the Deep Silence fan series. This fan-series features a new impeller design and was optimized for the best possible mix of silence and cooling capacity. The Deep Silence 2 case is fitted with a 2-channel fan control for up to 6 fans in order to adjust the air flow to the individual needs of the user. The Nanoxia Deep Silence 2 is eqipped with a total of three Nanoxia VentCovers. They close the 120/140 mm fan openings in the top cover and the left side panel. Thus, the user can at any time choose between improved cooling of the system by incorporating further case fans or improved sound insulation, by leaving the VentCover in place. All of these features reflect the developers’ objective to offer the user broad possibilities to personalize the adjustment between the lowest possible noise and an excellent cooling performance. The integrated fan control can manage up to six fans, allowing an individual to optimize settings to balance low system temperatures and the lowest possible noise levels, even at an almost full fan assembly. A unique feature of the Deep Silence 2 is the special designed Mounting Bracket, which allows it to improve the ventilation of the hard disk drives considerably. It is fitted to the hard disk cage and can be easily dismounted. It is suited for up to two 120 mm fans. The vast interior space of the Nanoxia Deep Silence 2 ensures that no space problems can occur here. The Mounting Bracket is perfectly suited to mount a 120 mm or 240 mm radiator and equip it with up to four fans. You can install two 120/140 mm fans under the top cover of the case, to further optimize the dissipation of waste heat generated by the processor. To optimize the cooling of the graphics card, a 120 or 140 mm fan can be accommodated in the left side panel. The air vents in the side and under the top cover are sealed with Nanoxia VentCover’s. Finally, a 120 or 140 mm fan can be mounted at the bottom of the case. Front and bottom of the case are equipped with easy to clean dust filters. The Nanoxia Deep Silence 2 offers a variety of very convenient product features. As can be expected, the optical drives can be mounted without requiring tools. A total of three external 5.25"drive bays are available. A 5.25 inch to 3.5 inch adaptor is included to permit for example the installation of a card reader. Thanks to the front door, a uniform look is guaranteed, even if using differently colored drives. You can accommodate up to seven 2.5 inch or 3.5 inch hard disk drives in the Deep Silence 2. The hard drives are installed in special mounting carriages, which are designed to accommodate both 2.5" HDD / SSD as well as 3.5" HDD. Screws with rubber suspension are used to hold the drives in place. A second pair of mounting holes is available to mount the hard disks in the carriages with the connectors pointing to the front, which can be useful, if frequent changes of the hard drives are on the agenda. Due to the outstanding depth of the case it is possible to install extra-long graphic cards with a maximum length of up to 345 mm. If you dismount the Mounting Bracket, a total of incredible 370 mm installation space is available.